One of the great benefits of practicing yoga is creating or improving the strength of the core. The core of the body is more than just the abs, but really the entire torso of the body and upper legs. A strong core promotes good posture (thanks mom! ), allows organs ample room to function, creates balance and stability, and energizes daily tasks. Many yoga poses that we practice contribute to the strength of the overall core like High Plank, Tāḍāsana, Śalabhāsana, and this week’s pose Vasiṣṭāsana. Vasiṣṭāsana or Side Plank Pose requires the full body activation of High Plank and an integrated balancing arm. In all of these variations, the belly lifts towards the spine, the back is long, and the serratus anterior or the muscle just below the armpit is activated. To find this muscle, hold your elbows out wide and try to hug your armpits closed without moving your elbows. They won’t close, but you should feel the activation of the side body. Option 1 – Top Leg Support. Actively engage the shoulder in the socket. The shoulder should not protrude from the socket or dump into the back, rather the shoulder blade is pulled onto the back body so that you feel all of the surrounding muscles engaging to create stability. Grip the mat with a strong bottom hand. Walk the top foot, so it is in line with the hip providing support for the lower body. 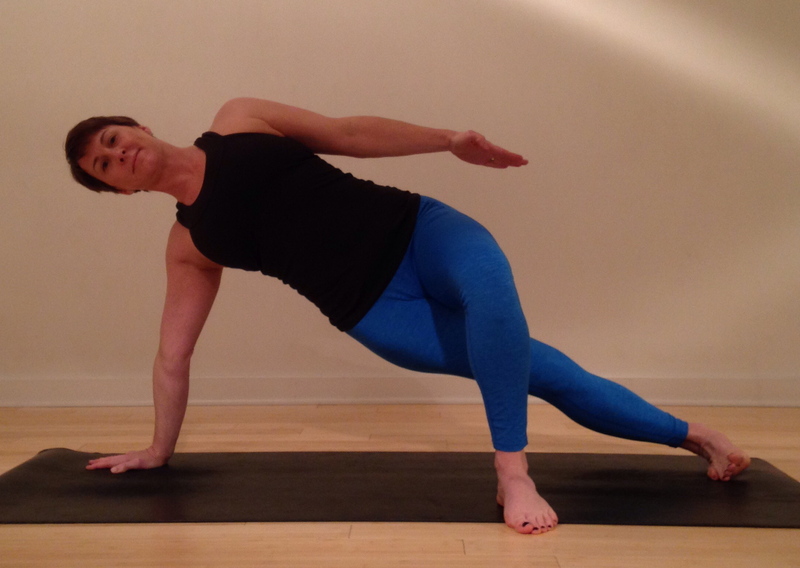 Keep the hips lifted, creating one line from the bottom foot to the crown of the head. Option 2 – Crossed Legs. When the balancing arm and shoulder feels secure, step the top foot back and place it in front of the bottom foot, crossing the calves. Scissor the legs together, activating the inner thighs. Keep the feet flexed, balancing on the blade edge of the bottom foot and the arch edges of the top foot. Reach the tailbone toward the heals without tucking. Option 3 – Stacked Feet. Keeping the alignment of the crossed leg variation, stack the top foot directly on the bottom foot. The feet stay flexed as if there is a board or a block underneath them. For added challenge, take the arm overhead in line with the body and take the drishti or gaze to the hand. Option 4 – Variations with Bottom Foot Grounded. 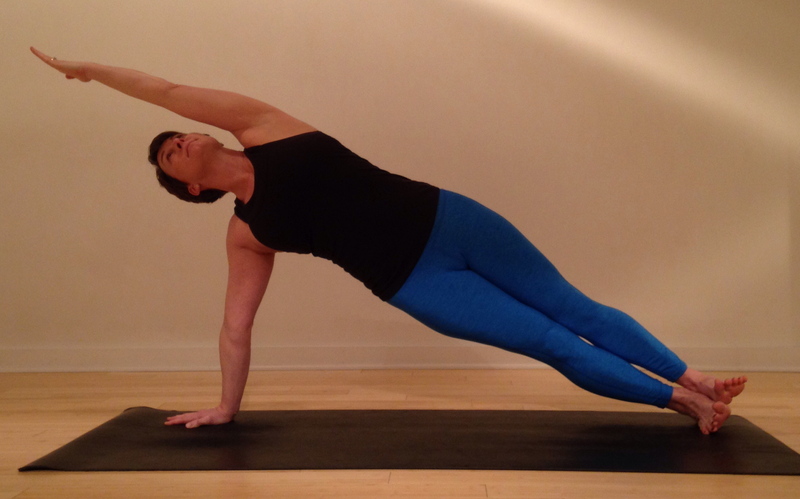 Once you are stable in a full side plank posture, there are many variations that can be explored. In all of the variations, the bottom foot begins to reach to the floor, eventually grounding all four corners of the feet. This requires a lot of flexibility and stability in the bottom ankle, so work to reach the arch edge of the foot toward the floor. This extra grounding creates a more stable and versatile posture. Try bringing the top leg into a tree position or bending the knee and reaching back for the top of the foot. Another variation is to add uttitha pādānguṣṭāsana or an extended big toe hold (pictured). 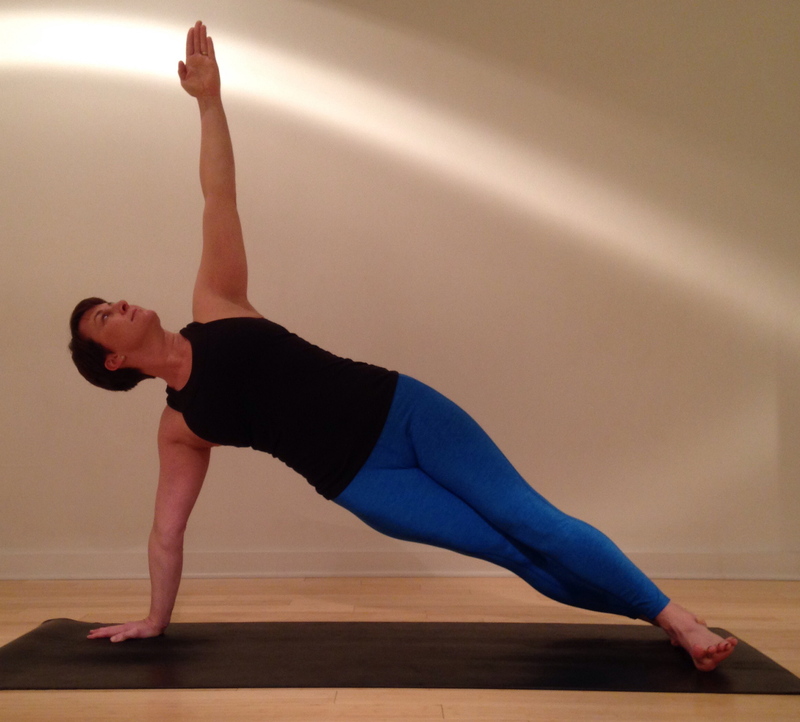 In addition to strengthening the core, Side Plank Pose can be a very empowering and grounding posture. Be kind to and mindful of your shoulders as you explore the different variations of this pose. Follow along @suzannewrightyoga on Instagram or at Suzanne Wright Yoga on Facebook. If you post your pictures or about your experience be sure to tag #PowerPose and @suzannewrightyoga.